This game rocks! 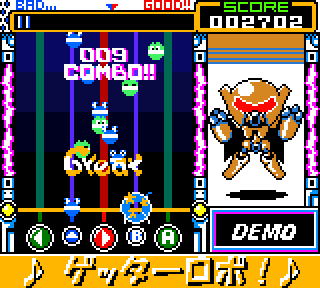 It's basically a Guitar Hero game, but on the GBC! You use 5 buttons: Left, Up, Right, A, and B. You may think it won't work, but it does! It's so much fun! So this game is has about 20 songs (PLEASE Don't correct me if I'm wrong), with hits from Saint Seiya, Dragon Ball and Z, Mazinger Z, Galaxy Express 999, and LOTS more! I don't know 3 quarters of the anime's on here, but I love their themes! This game is actually a port of the PS1 game of the same name, but honestly, I think this ones SOOOO much better! It has 2 extra songs, 5 buttons means that playing on a GBC makes the gameplay manageable, as the PS1 version requires you to use 10 buttons (Better if you use the pad made for it, but that ain't gonna work on the PSP) and while the PS1 version has remixes of the tracks with lyrics, the GBC Version has lyrics on the bottom, but good luck reading it unless you're good with reading Kanji! And yes, I know this is a big game in the Pop'n Music series, but honestly, I never played the others. Except the Disney one. So yeah, overall, this game is so good! Definitely play it on your favorite emulator if you like anime! Now you can add videos, screenshots, or other images (cover scans, disc scans, etc.) for Pop'n Music GB - Animation Melody (Japan) to Emuparadise. Do it now! If you haven't noticed yet, we have a retro game of the day feature (top-right of the screen) wherein we feature a new retro title every single day! Now, you can vote for your favorite games and allow them to have their moment of glory. Click on the button below to nominate Pop'n Music GB - Animation Melody (Japan) for Retro Game of the Day.